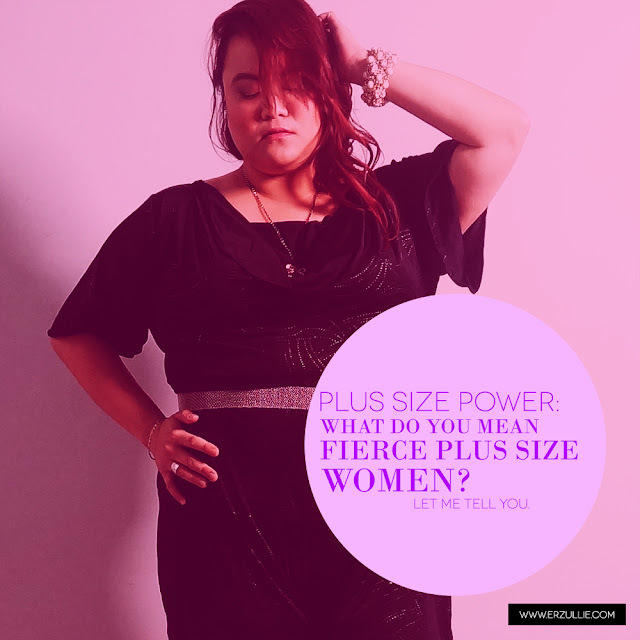 PLUS SIZE POWER: WHAT DO YOU MEAN FIERCE PLUS SIZE WOMEN? I have always talked about "fierce plus size women" in this blog (aka Erzulliestas). But I have come to realize that I haven't really defined what a fierce plus size woman actually means. I have defined what a confident curvy means, but not really much on a fierce plus size woman. Fierce, as defined by the common dictionary, means: "showing a heartfelt and powerful intensity". It's about being authentically empowered from the inside and emanating it to the outside. Partner that up with plus size women, it just basically means plus size women showing a heartfelt and powerful intensity with them. For short, when you see them, there's just something about them. A quiet yet strong force in their presence. So... what is that force? What is that power within? This is where all women have to sit down and reflect on their own definition. But as a lover of fierce plus size women, this is what I have learned from you. Being empowered means living unapologetically in accordance to your own personal truth of who you are. In this case, you are an Erzulliesta. You are plus size woman with a love life (in all forms), career, ambition and personal view on how to live your life and style in general. You love to think for yourselves and have direct and control your perspective of who you are. For short, I am pretty sure that there are a lot of things said about an Erzulliesta, but I know that you ladies have a smile on your face every time you are about to go to bed because you have lived that day in accordance to who you want it to be. And I am also sure that when you have read this, your mind went on thinking "Wait. Something was said about me?" And at that point, that just made you even more allurin for people. You are so busy about yourself and the things that you love, that no other thought can go through that. So yeah. That's what I mean about fierce plus size women. What about you?